Congrats to Gregory Zakwin on being the lucky winner of the Luis Severino 2018 Topps Series 2 Major League Material Black Parallel Relic #’ed/99. Once Gregory Zakwin sends me his mailing address, I will ship this card ASAP. Thanks! Congrats to Gregory Zakwin on being the lucky winner of the Aroldis Chapman 2017 Topps Heritage High Number Clubhouse Collection Relic. Once Gregory Zakwin sends me their mailing address, I will ship this card ASAP. Thanks! 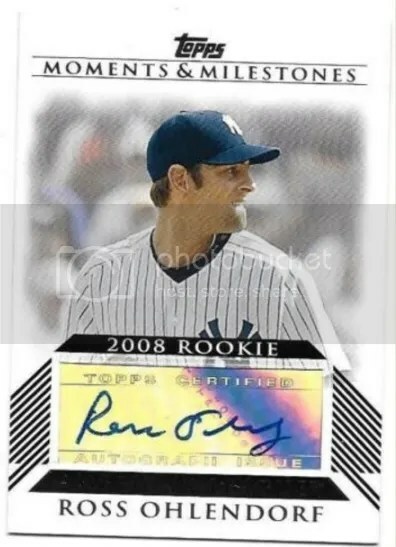 Congrats to hudsonfan15 on being the lucky winner of the Ross Ohlendorf 2008 Topps Moments & Milestones Rookie Auto. Once hudsonfan15 sends me their mailing address, I will ship this card ASAP. Thanks!